2 What percentage of HR leaders say their leadership pipeline is lacking? a. 25% b. 42% c. 65% d. 74% e. 85% 3 What is the average age of Express employees? a. 22 b. 27 c. 31 d. 43 e. 49 4 Which brands earned Best of Elearning! Award every year? a. Skillsoft b. Articulate c. Adobe d. Cisco e. All of the above 1 What is the size of the Virtual Reality market today? a. $5 billion b. $10 billion c. $15 billion d. $35 billion e. $50 billion 5 What percentage of organizations are planning to improve or develop a new enterprise HR system strategy this year? a. 12% b. 35% c. 40% d. 56% e. 89% 6 How much do learners retain 24-hours after a training course? a. 10% b. 20% c. 30% d. 50% e. 70% 7 Where is top technology talent employed? 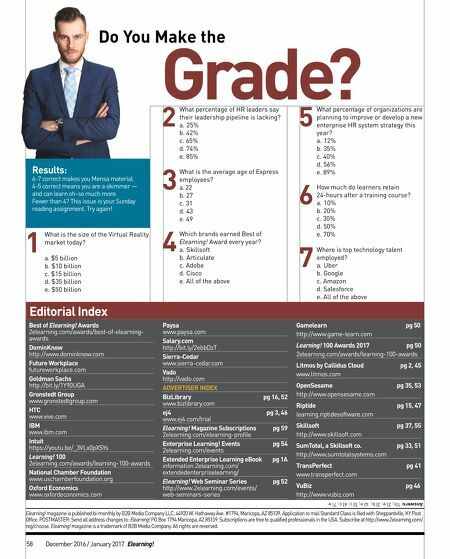 a. Uber b. Google c. Amazon d. Salesforce e. All of the above Do You Make the Grade? Best of Elearning! Awards 2elearning.com/awards/best-of-elearning- awards DominKnow http://www.dominknow.com Future Workplace futureworkplace.com Goldman Sachs http://bit.ly/1Y90UGA Gronstedt Group www.gronstedtgroup.com HTC www.vive.com IBM www.ibm.com Intuit https://youtu.be/_3VLx0pXSYs Learning! 100 2elearning.com/awards/learning-100-awards National Chamber Foundation www.uschamberfoundation.org Oxford Economics www.oxfordeconomics.com Paysa www.paysa.com Salary.com http://bit.ly/2ebbDzT Sierra-Cedar www.sierra-cedar.com Vado http://vado.com ADVERTISER INDEX BizLibrary pg 16, 52 www.bizlibrary.com ej4 pg 3, 46 www.ej4.com/trial Elearning! 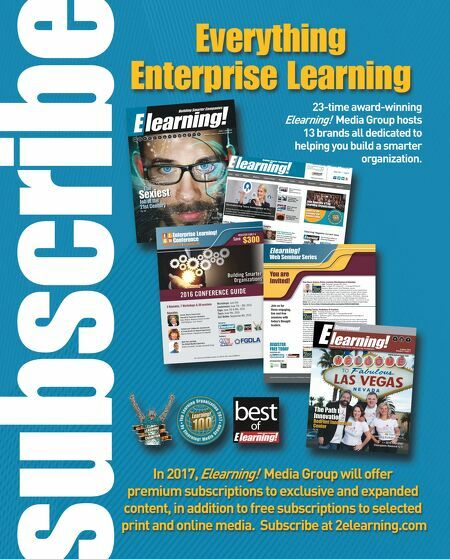 Magazine Subscriptions pg 59 2elearning.com/elearning-profile Enterprise Learning! Events pg 54 2elearning.com/events Extended Enterprise Learning eBook pg 1A information.2elearning.com/ extendedenterpriselearning/ Elearning! Web Seminar Series pg 52 http://www.2elearning.com/events/ web-seminars-series Gamelearn pg 50 http://www.game-learn.com Learning! 100 Awards 2017 pg 50 2elearning.com/awards/learning-100-awards Litmos by Callidus Cloud pg 2, 45 www.litmos.com OpenSesame pg 35, 53 http://www.opensesame.com Riptide pg 15, 47 learning.riptidesoftware.com Skillsoft pg 37, 55 http://www.skillsoft.com SumTotal, a Skillsoft co. pg 33, 51 http://www.sumtotal.com TransPerfect pg 41 www.transperfect.com VuBiz pg 46 http://www.vubiz.com Editorial Index Elearning! magazine is published bi-monthly by B2B Media Company LLC, 44920 W. Hathaway Ave. #1794, Maricopa, AZ 85139. Application to mail Standard Class is filed with Sheppardville, KY Post Office. POSTMASTER: Send all address changes to: Elearning! PO Box 1794 Maricopa, AZ 85139. Subscriptions are free to qualified professionals in the USA. Subscribe at http://www.2elearning.com/ reg/choose. Elearning! magazine is a trademark of B2B Media Company. All rights are reserved. Answers: 1)c; 2) e; 3) b; 4) e; 5) c; 6) c; 7) e Results: 6-7 correct makes you Mensa material. 4-5 correct means you are a skimmer — and can learn oh-so much more. Fewer than 4? This issue is your Sunday reading assignment. Try again! 58 December 2016 / January 2017 Elearning!